Researchers at Johns Hopkins Medicine have identified in live human brains new radioactive “tracer” molecules that bind to and “light up” tau tangles, a protein associated with a number of neurodegenerative diseases including Alzheimer’s disease and other related dementias. Two studies will be published back-to-back in the December issue of Journal of Nuclear Medicine—one as featured article of the month—describing testing of three candidate molecules in patients with Alzheimer’s disease, as well as the use of one molecule to measure the accumulation of tau proteins. 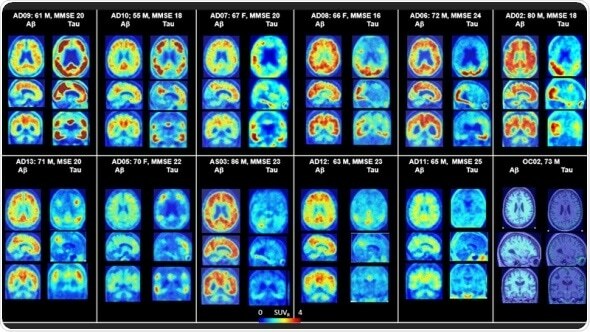 PET scans of the brains of Alzheimer’s patients successfully show a range of tau across a variety of patients and demonstrates the difference in regional patterns between amyloid and tau. Credit: Dean Wong, M.D., Ph.D. and Ayon Nandi, M.S., Ph.D.
Dean Wong, M.D., Ph.D., professor of radiology and radiological sciences, psychiatry and behavioral sciences, neurology and neuroscience, and director of the Section of High Resolution Brain PET Imaging, Division of Nuclear Medicine at the Johns Hopkins University School of Medicine. Alzheimer’s disease is characterized in the brain by the appearance of two abnormal protein structures: amyloid plaques and tangled fibers made up of a protein called tau. One of the biggest challenges in studying Alzheimer’s disease thus far, according to Wong, is the inability to watch these so-called neurofibrillary tangles develop in real time. As part of a longer-term project funded by F. Hoffman-La Roche, the team previously tested a collection of approximately 550 potential tracer molecules and identified six promising tracers, eventually narrowing them down to three to be made and tested as candidate Tau PET radiopharmaceuticals. These three most promising tracers were previously tested in nonhuman primates, and the results looked promising enough to test in people. The researchers recruited a total of 12 patients with Alzheimer’s disease, seven younger healthy controls (ages 25–38 years old) and five older healthy controls (age 50 or older) for brain-only PET scans. An additional six older healthy controls were recruited for full-body scanning. The study was divided into three parts. In the first part, each person was injected with two of the three randomly designated tracers (on separate visits) prior to receiving a brain PET scan with subsequent evaluation to determine which molecule performed best. In the second part of the study, researchers tested the optimal tracer, called F-18 RO948, with additional brain imaging in five patients with Alzheimer’s and five older controls, with follow-up of previously seen patients to evaluate the potential progression of tau protein tangling after an average span of approximately 16 months. The third part of the study examined six older controls undergoing whole-body scanning. In total, the researchers looked at 80 different regions in the brain to evaluate how well the tracers were taken up by the brain, how well they penetrated through the tissue and how specifically they bound to the tau protein rather than just sticking indiscriminately to anything. Regions of the brain that typically contain accumulated tau protein include the temporal lobe, parietal lobe and occipital lobe, among others; grey matter in the cerebellum is thought to contain low or no tau in patients with Alzheimer’s. They found that healthy brains retained little to no tracer, whereas the brains of those with Alzheimer’s showed tau to be in regions of the brain consistent with previously reported postmortem data on filamentous tangles. In the second paper, the team examined the detailed quantification of tau binding via F-18 RO948 in 11 patients with Alzheimer’s disease, five young cognitively normal controls and five older cognitively normal controls. They verified that detailed quantification of the tested and retested tracer in those five patients with Alzheimer’s and five older controls generated good and reproducible results. According to Wong, this body of work reveals that, as compared with the currently used Tau tracer, F-18 AV1451, the new tracer, F-18 RO948, does not bind randomly to other tissue, offering greater clarity into quantification of potential tau burden within the human brain.